Mild-mannered and obedient, Basset Hounds are excellent members of the household. And they’re also a whole lot of fun. Slightly mellow—but not shy—they can just as easily hang out around the house as romp through the fields. Great all-around playmates, Basset Hounds have a cute and adorable droopiness that can be pretty much irresistible. With a history of badger and rabbit hunting in the 1600s, this hound was used to help sniff out trails when hunting. 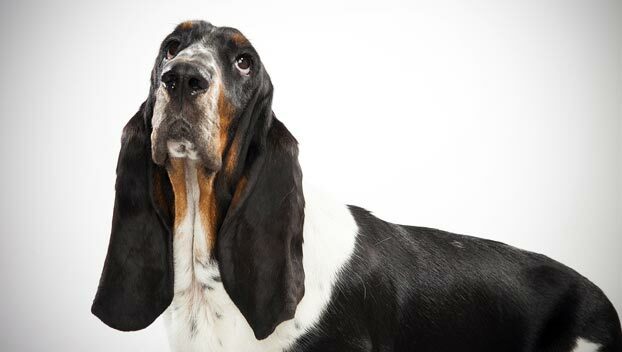 Short-legged with fast and smooth movements, the Basset Hound loves and lives to sniff. Though he has a calm temperament, this dog loves activity outside the home and could run every hour if allowed. A loyal companion, this breed will think he's your owner instead of the other way around. An affectionate pet, he may have a temper when being trained or told what to do. Like all hounds, Bassets can be stubborn and difficult to train and housetrain. Crate training is recommended. If they catch an interesting scent, Basset Hounds may try to follow it, no matter how much danger it poses to them. Keep your Basset on leash when outside and not in a fenced yard. Also, take him to obedience class and be sure he responds well to the Come command. Use gentleness and patience to train him. 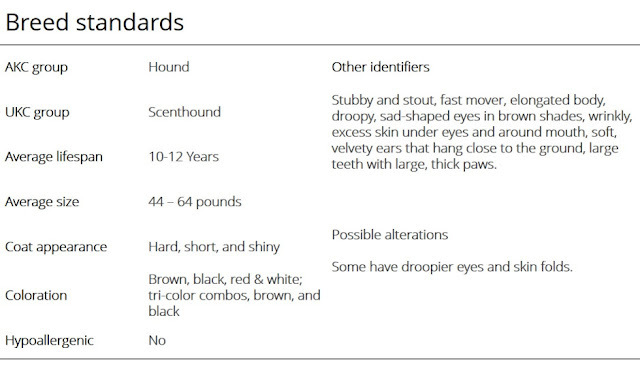 Hounds of all types typically think for themselves and don't respond well to harsh training techniques. One of the primary reasons that Basset Hounds are given up to rescue or for adoption is that they "drool too much." Because of the loose skin around their mouths, they also tend to make quite a mess when they drink. If you're a fastidious housekeeper who can't stand drool, a Basset Hound is not the best choice for you. Basset Hounds often have flatulence. If this problem seems excessive, talk to your vet. A change in diet may help. Obesity is a real problem for Basset Hounds. They love to eat and will overeat if given the chance. If they put on too much weight, they can begin to have joint and back problems. Portion out food relative to your Basset's condition, not by the recommendation on the bag or can. Because Basset Hounds are prone to bloat , it's better to feed them two or three smaller meals a day rather than one large meal a day. Don't allow your Basset to exercise too strenuously after eating, and watch him for about an hour after eating to make sure he's okay. 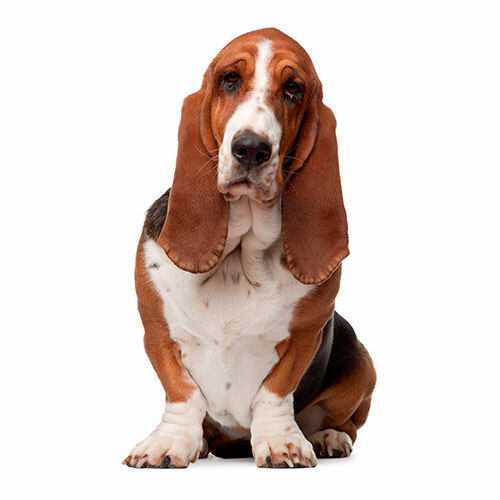 Your Basset's long ears need to be checked and cleaned each week to help prevent ear infections. You may find that you need to wash the ear flaps even more often, because they can drag in puddles and pick up dirt as they drag the ground. 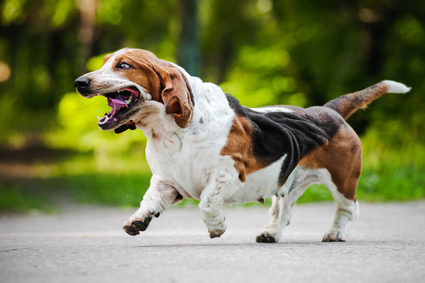 Basset Hounds can howl loudly, especially if they are left along for long periods of time. Even though your Basset Hound is strong and amazingly agile for having such short legs, it's best to discourage him from jumping, for example, out of a car. Pick him up and support his back to ensure he doesn't get hurt. Basset puppies can suffer from joint problems as they grow. Try not to allow your puppy to overdo things when he plays and discourage him from jumping on and off furniture. With two-thirds of their body weight in the front of their bodies, Basset Hounds are not great swimmers. Don't allow your Basset Hound to fall into a swimming pool because he can quickly get into trouble. To get a healthy dog, never buy a puppy from a backyard breeder, puppy mill, or pet store. Look for a reputable breeder who tests her breeding dogs to make sure they're free of genetic diseases that they might pass onto the puppies, and that they have sound temperaments. 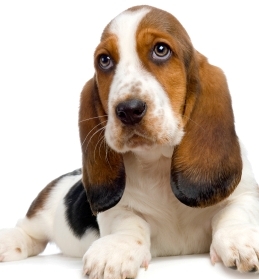 The Basset’s long ears serve a purpose: they sweep scent from the ground up toward his nose. Bassets need daily brushing because they shed constantly. 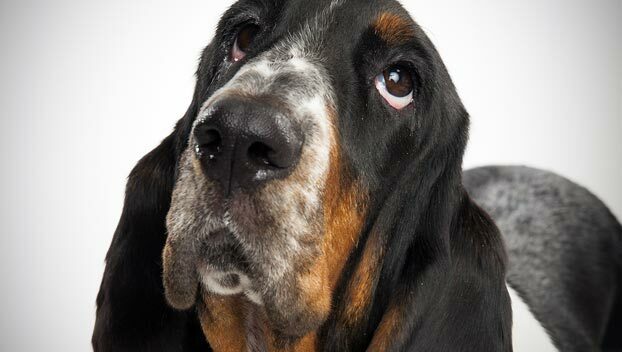 Bassets have an oily coat that gives the dog a distinctive odor. It’s not something that can be bathed away or perfumed out of existence. Some Bassets slobber and drool. The Basset descends from dogs developed at the 7 th-century abbey of St. Hubert in the Ardennes forest, where Abbot Hubert - now the patron saint of hunters, archers and forest rangers - was fond of hunting. He spent much of his time developing a new strain of hound with powerful scenting ability. They became known as St. Hubert hounds and were prized throughout France and England. One line of the St. Hubert hounds became the Bloodhounds of today, but another line produced short-legged, slow-moving dogs that became the preferred dog of hunters on foot in search of small game. The packs drove rabbits and hare from dense brush into open ground, where they could be seen by the hunters. Bassets first came to the United States in the early 19 th century, and the American Kennel Club began registering them in 1885. Bassets became well known in the 1960s after starring in an ad campaign for Hush Puppy shoes, and their popularity increased dramatically. The breed currently ranks 36 th in AKC registrations. 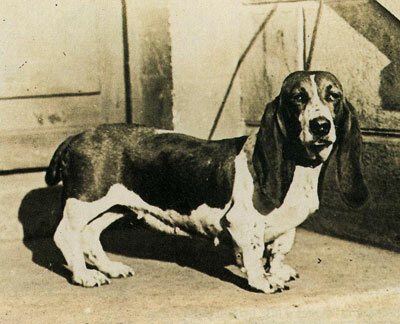 The Basset Hound was bred to hunt. Its keen nose and short stature are suited to small-game hunting on foot, and it particularly enjoys running in a pack. There are a number of groups that promote hunting with bassets. There is a variety of Basset Hound developed purely for hunting by Colonel Morrison that were admitted to the Masters of Basset Hounds Association in 1959 via an Appendix to the Stud Book. This breed differs in being straighter and longer in the leg and having shorter ears. With their droopy eyes, long ears and short stature, basset hounds can sometimes look like sad, old men. 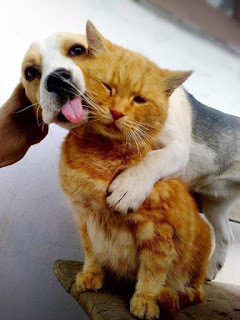 In truth, they are active, affectionate and loyal, and because of their pack nature, get along well with people and other pets, making them an ideal family companion. Bassets will welcome rumpus playing with children, but will sit quietly on the lap of an adult when it's time to relax for the evening. Basset Hounds may bark to sound an alert that someone is nearing the home, but once they greet a guest, will quietly return to their favorite sun-bathing spot on the floor. Do not overfeed these dogs because extra weight places too great a load on the legs and spine. A problem area is possible lameness and eventual paralysis because of short legs and a heavy, long body. As they are prone to bloat, it is also wise to feed them two or three small meals a day instead of one large meal. If they do eat a large meal keep an eye on them for several hours for any signs of bloat. 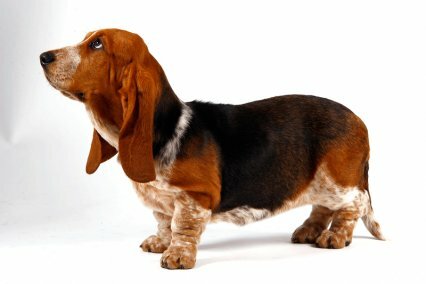 Basset Hounds are usually calm dogs that do well even in small houses and apartments. They should live indoors with their family, ideally with access to a yard. They're not suited to living outdoors in extreme heat or cold. Bassets are inactive indoors, happy to lie in the sun all day, but they'll enjoy a long and meandering walk with lots of sniffing time. Don't be tempted to let your Basset become a couch potato. Bassets are prone to obesity, and too much weight can stress their joints. When Bassets are outdoors, they should be in a fenced yard or on leash so they don't wander off after an interesting scent. Until he's a year old, discourage your Basset puppy from jumping on and off furniture and going up and down stairs, which puts extra stress on his front legs and back and can injure his joints. You may need to help a Basset of any age in and out of the car. He's not a very good jumper. Consider getting him a ramp or steps. Bassets can be independent, with a mind of their own. Train them with kindness and consistency, using positive reinforcements that include food rewards and praise. The Basset who's treated harshly will simply become more stubborn and less willing to do your bidding. Your best bet is to keep training interesting. Bassets will develop selective hearing if there's something more exciting to pay attention to. The Basset Hound will do okay in an apartment. They are very inactive indoors but outdoors they will run for hours in play if given the chance. They will do okay without a yard, but should be given plenty of opportunities to run and play to keep healthy and trim. Training a Basset can be a challenge. Some consider this a sign of low intelligence, but the truth is they are highly intelligent and independent, making them resistant to obedience. This independent nature can make them immune to discipline, and their lack of a desire to please people makes positive reinforcement training difficult. Basset hounds love to eat, so training with treats and a lot of patience will yield the best results. They will walk all over a meek trainer, so a confident nature is important when training a basset hound. Bassets are hunting dogs with a keen sense of smell. If a basset picks up a scent, he will tune everything else out while he tracks the smell and will not respond to his owner's desperate attempts to call him home. For this reason, it is best to keep basset hounds on a leash or in a fenced-in area. Basset hounds need exercise. Not as much as a larger-breed dog, but they are prone to weight problems if they do not get enough outside activity. Their short stature is misleading – a basset hound can weigh as much as 60 pounds, so they do need plenty of time to stretch their legs every day. A family home with a yard to run and play in is ideal for a this breed, but apartment dwellers who are committed to walking their dog regularly and visiting a dog park for play ,can raise a healthy, happy Basset as well. The Basset has a short coat that requires daily care because it sheds heavily. Brush it with a rubber curry brush daily if you want to keep all the loose hair under control. The brush removes dead hairs that would otherwise end up on your floor, furniture and clothing. The oily Basset coat gives the dog a “houndy” odor. Some people like it, some people loathe it. If you’re a loather, you can bathe your Basset weekly to reduce the smell, but it will never completely go away. The rest is basic care. Trim his nails as needed, usually every few weeks, and brush his teeth for good overall health and fresh breath. Bassets are fond of children and get along well with them. If anything, you'll need to protect your Basset from being ridden or otherwise tormented by them. Always teach children how to approach and touch dogs, and always supervise any interactions between dogs and young children to prevent any biting or ear or tail pulling on the part of either party. Teach your child never to approach any dog while he's sleeping or eating or to try to take the dog's food away. No dog should ever be left unsupervised with a child. Being pack dogs, Bassets enjoy the company of other dogs and can also get along fine with cats, especially if they're introduced at an early age. A great family pet, the Basset Hound has a calm nature that goes well with children and other dogs. With a small, stout body, it's best he doesn't partake in rough play with children as he doesn't care for it much either. In need of a yard to exercise his hunting instincts, this breed may not be appropriate for city-dwellers unless he's walked regularly. The Basset Hound takes his name from the French word bas, meaning “low.” Because he was low to the ground, the Basset easily found and followed the scent of its quarry, carried up toward its nose by long ears that swept the ground. This low-maintenance breed will wake up to sniff out the aroma coming from the kitchen. After discovering what's to eat, he'll be ready for a walk to smell what today has to offer. Once done with his walk, the Basset Hound will be ready for a snooze. Waking up from his lazy afternoon nap, he'll be fine visiting with company or enjoying sniffing out your plans for dinner. Ending his day with another walk on the trail, this hound is easily set on finding what that smell is leading to, so be sure to keep him in a safe spot.